Carbon is the best bookmaker app for United States horse racing and sports betting fans. 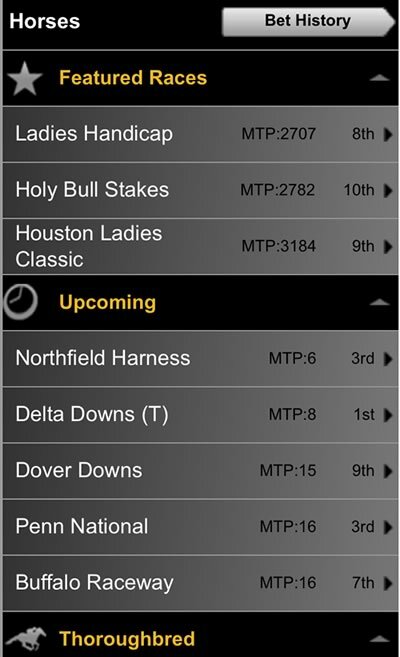 It is the only fully horse race and greyhound betting app available to punters in U.S. Carbon Mobile work on any type of internet-enable phone. Carbon Sports are currently experiencing problems processing customer withdrawals. 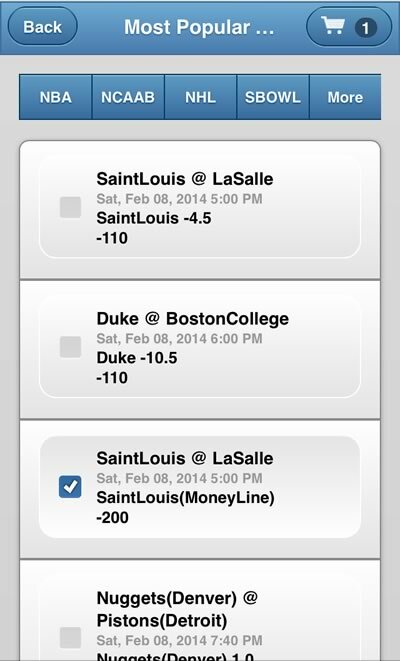 As a results, we NO LONGER advise our US-based readers to use this mobile sportsbook. 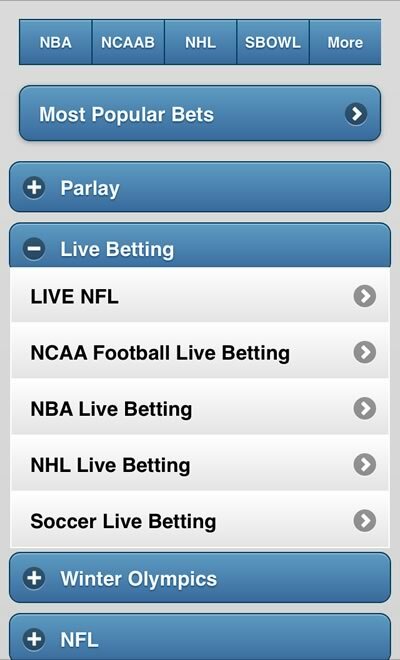 Bovada www.Bovada.lv is currently the best options for mobile sports betting in the USA. Bodog/Bovada are a trusted brand that offer prompt payouts. Read our full Bovada sportsbook app review or download the app below. United States citizens welcome. Mobile wagers on any sports or race. Bet on EVERY horse (thoroughbred), harness or greyhound race. iPhone, Android, Windows Phone and BlackBerry compatible web app. 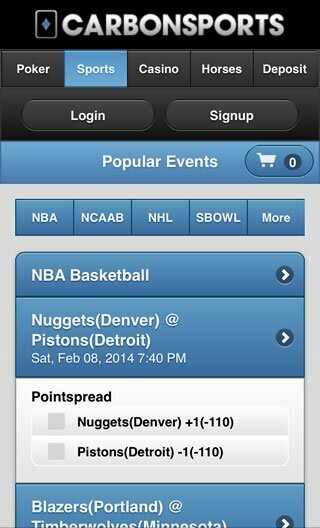 Use the mobile app & get a $25 first free bet when you place a wager. 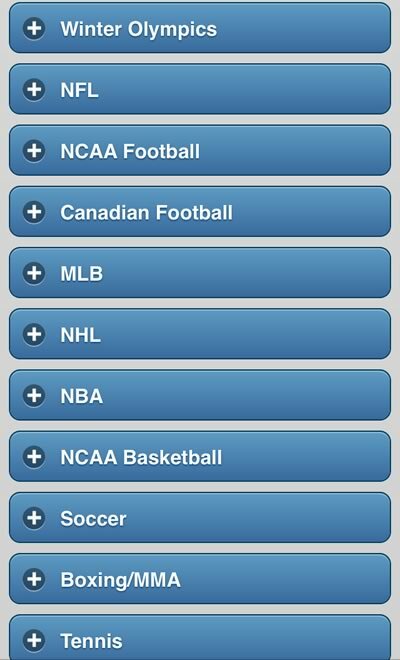 Live betting on NFL, NCAA, NBA, NHL & soccer from your smartphone. Odds offered on Politics (2016 US Election) or on events like The Oscars. The app also features Texas Hold'em, blackjack, roulette, slots & more. Building on the success of their initial online business, CarbonPoker, in 2012 CarbonSports was formed, providing comprehensive online sports and race betting plus the full poker and casino experience. CarbonSports mobile site is available on iOS (iPhone/iPad), Windows Phone (Nokia Lumia), BlackBerry and Android (Samsung Galaxy, Google Nexus, HTC One, Motorola DROID, LG) devices. 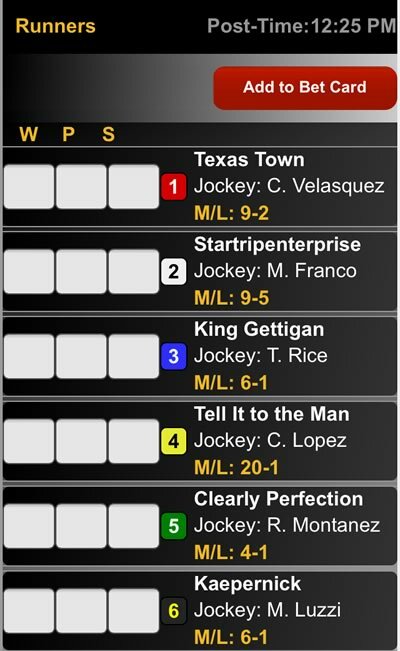 It is the only United States friendly bookmaker app to also feature a full horse racing section. You can place bets from EVERY racetrack in the US as well as a racecourses in the Ireland and the United Kingdom. Aside from the impressive array of bet option and markets, along with numerous promotions offered by CarbonSports, the main standout features are arguably live in-play betting availability and the casino integration offered by the site. A live betting schedule is shows the variety of in-play betting options available to users both in the sports book and race section. The options are considerable. Casino and poker integration further provides a nice alternative feature for those looking to have a punt but who may not be tempted by any of the sports or race markets on offer. The CarbonSports online site is a specially adapted mobile site for use on tablet and mobiles on the go. The mobile site has access to all the same betting features and options as the main site but benefits from having been adapted to the smaller screen; simplified there is a greater focus on wagering and less tabs relating to non-betting issues. The site looks great on the small screen with a clear layout and simple colour scheme. The main areas are in a row across the top of the screen with tabs providing direct access to the sports book, horse racing section, casino and poker, plus the deposit section for funding your account. In the sports section, the key wagering sports are set out across the main section along with a further area displaying the current most popular bets. Clicking on individual sports tabs provides a drop down section showing relevant competitions, games and bets. The racing section is similarly laid out and easy to access. Users are met with a featured races section listing the main race events of the day with upcoming races and meets accessed below. The section is also subdivided into thoroughbred and harness sections with greyhound race wagers also displayed below. Navigation around the site is logical and hassle-free and offers a direct and uncomplicated user experience for those wanting to wager on the move. A number of attractive promotional offers are available for both those looking to open an account and for existing customers on specific bets. For new customers, a 25% bonus is provided to new customers registering with the site and depositing their initial sum. New punters will receive ‘free money’ credited to their account to the value of 25% of their initial deposit up to a maximum $250 bonus. For new users placing a bet on the sports book, a free wager up to the value of $100 is also offered. 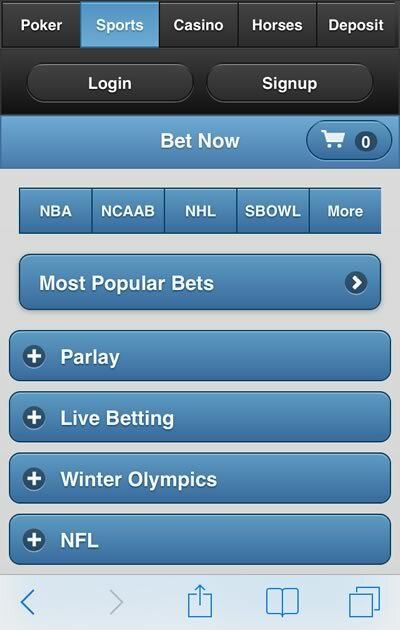 A free bet up to the value of $25 is also available to new customers when placing their first bet via a mobile device. In addition to opening promotions aimed at new customers, CarbonSports also rewards regular punters with a number of promotions. Every Thursday, re-deposits will be rewarded with an additional 5% added to accounts. For horse race punters, a daily reward programme sees CarbonSports deposit 3% of your previous days’ horse race wagers back into your account for win, place and show bets. A tidy little offer for regular race punters. A further weekly promotion comes in the form of a ‘double your winnings’ offer. Each week CarbonSports will double your winnings on a specifically presented game prop with winning bets doubled up to $50. Naturally, sports and race wagering options are widest in the U.S markets with a huge array of markets and bet types offered on traditional North American sports such NFL, NBA, plus other major sports such as golf, boxing and UFC. Sports with an international slant, however, are also given detailed coverage ranging from soccer (including extensive offers on competitions such as the World Cup) to rugby union and athletics. Non-sports markets are available for the more adventurous punter with options ranging from the Oscars to the U.S elections. Given the particular emphasis on the U.S markets, at CarbonSports line betting on the spread and parlay bets are given special attention. NFL, basketball and baseball are all made for betting on the spread and CarbonSports provides many options here. Proposition bets and teasers are also available, along with the more regular straight bets. A welter of information regarding everything from bet types, betting and gaming rules to information on specific sports is contained on and searchable within the site. Further information is provided regarding any difficulties that may be encountered, technical or otherwise, in managing your account or depositing and withdrawing balances. Look for the information you require via the frequently asked questions section or place your enquiry in the site search engine. Customer support for those with a specific issue regarding their account is available 24 hours a day 7 days a week. Contact is via email, which may frustrate those wishing to talk to a customer service representative in person, however, this may be due to an international customer base and CarbonSports promises swift and efficient service via a 200 strong customer service team. Impressively, customer support is available in a number of different languages. 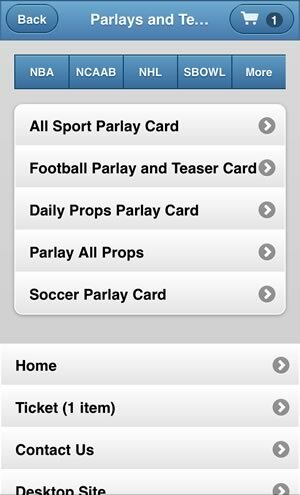 The CarbonSports mobile site provides a clear, easy and efficient platform for those wanting to bet on the move. With its’ logical and swift navigation, good layout and attractive look, this simplified site is an excellent option for the average punter looking for a solid betting option. For European based customers looking for a wide range of markets to bet on, both internationally and closer to home, this is likewise a good choice. Punters can branch out via the extensive markets offered on the range of North American sports whilst still being catered for domestically on more traditional European sports and races (arguably U.S sites offer greater coverage of European markets and sports than vice versa). Although not as cutting edge as some sites when it comes to advanced features such as live streaming, the site makes up for it with its’ range and number of promotional offers for both new and existing customers alike. Overall, the site has a safe and secure feel to it and is likely to be an excellent option for most people, especially the infrequent to more regular punter. A good first choice for those looking to explore the online gaming and betting world.